Spreading the Word via Social Media! Our Global effort to advocate for literacy would not be possible without the magic of social media. As World Read Aloud Day (WRAD) is an international event, social media is a key force in uniting all of our literacy leaders across the hemispheres together on March 7, 2012. We are so excited to have a circle of bloggers and social media WRADvocates on board to join us in spreading the message, and we'd like to continue growing our community! If you are interested in sharing your voice for WRAD, you can do so by blogging, Tweeting, or Facebooking for the cause, and use the WRAD 2012 Badge as your avatar icon from now through March 7 to show your support to all your friends and followers! Worldwide at least 793 million people remain illiterate. Imagine a world where everyone can read... On March 7, 2012, LitWorld, a global literacy organization based in New York City, will be celebrating World Read Aloud Day. 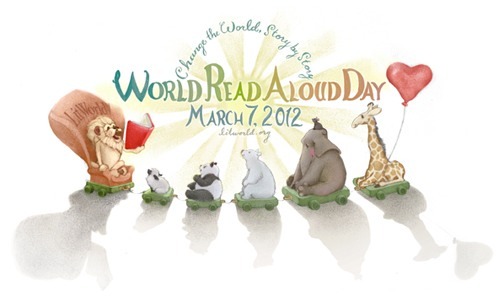 World Read Aloud Day is about taking action to show the world that the right to read and write belongs to all people. World Read Aloud Day motivates children, teens, and adults worldwide to celebrate the power of words, especially those words that are shared from one person to another, and creates a community of readers advocating for every child’s right to a safe education and access to books and technology. By raising our voices together on this day we show the world’s children that we support their future: that they have the right to read, to write, and to share their words to change the world. Make sure to follow LitWorld!